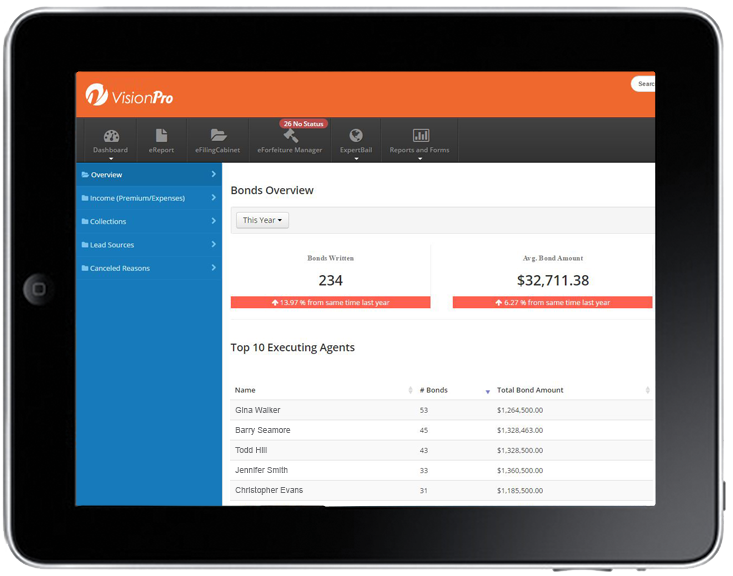 VisionPro | The bail industry’s most advanced bail bond management software. 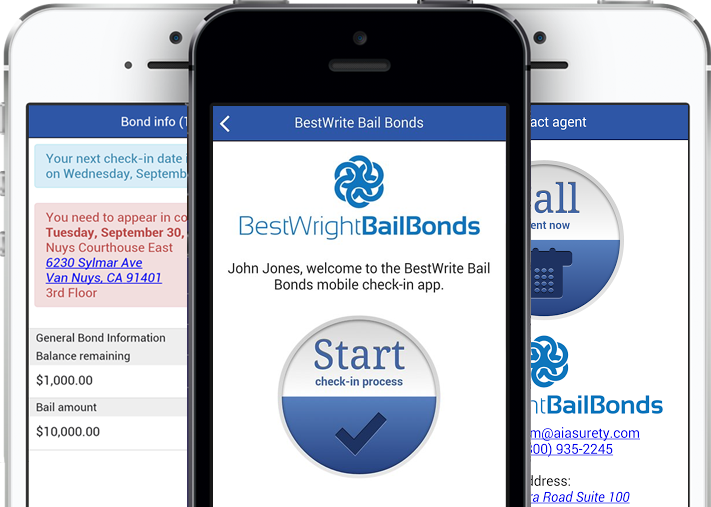 The bail industry’s most advanced and user friendly bail management software. To learn more about this innovative new system and to sign your agency up for VisionPRO, click on a button below. 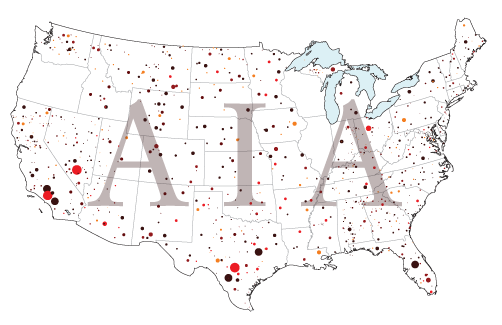 Who better to bring you the best bail agency software available than the nation’s oldest and largest family of bail bond insurance companies, AIA? The only way a software company makes money is by selling you software. The only way a bail bond insurance company makes money is when its agents write bail. That leads us to a couple important questions. Would you rather be a paying customer of a software company that just gives you software, or the partner of a bail bond insurance company that gives you the tools you need to grow your business? We think the answer is pretty simple. If you are interested in putting your bail agency on the fast track to success, and getting VisionPRO for FREE, contact our team today at (800) 935-2245 to learn how to qualify. Vision is Power. Vision is Insight. Vision is Control. Isn’t it time that your agency had Vision? Run your bail bond agency more efficiently! Our mobile flexibility allows you to service your clients from anywhere on any device. 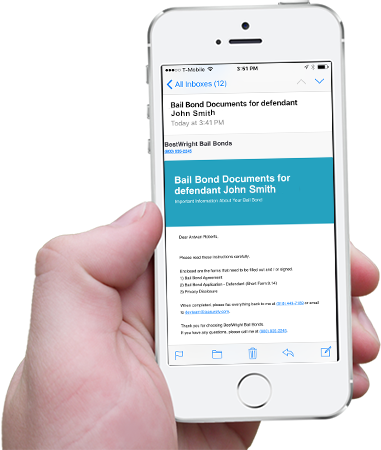 Send text, voice, email or regular mail notifications to defendants, attorneys and indemnitors. Make things easier for you by having defendants simply check-in via their mobile device from any location they want. Accurately track the current and historical movements of your defendants over the course of their pretrial release. 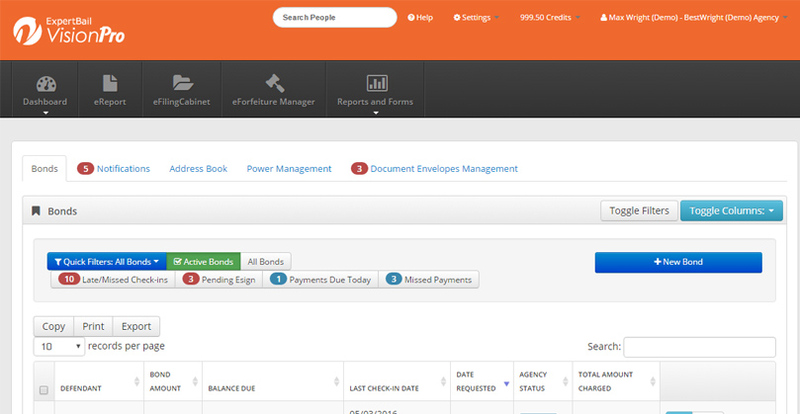 Create, manage and track payment plans for defendants and indemnitors. Track leads across multiple marketing channels to determine efficiency and effectiveness. Run an instant arrest history report on each and every defendant with immediate results. Document Management/Auto-Generated forms – Auto populate all the required bail forms and documentation right from the system. Get notified when a defendant you have on bond gets rearrested anywhere around the country. Accept, organize and distribute powers across your agency. VisionPRO is not only affordable, it is FREE. Yes, we said FREE! Software companies make money selling software… AIA makes money when its agents write bail. So, while software companies are focusing on selling you software, AIA is focused on helping you grow your business. It is for this reason why AIA offers VisionPRO for FREE! Yes, any licensed bail agent can get all the advanced features and benefits of VisionPRO at no cost. All they need to do is meet one condition: they must be an appointed agent with AIA. In today’s competitive bail industry, you have a choice. You can sit and wait for your clients to come to you or you can go out and get them. With its advanced mobile features, VisionPRO gives you the mobility to complete a bail transaction on your mobile device and manage your entire business from anywhere you need to. It’s not just mobility… it’s extreme mobility. NEVER PLACE ANOTHER REMINDER PHONE CALL AGAIN. Let VisionPRO do the work for you with automated notifications. Whether you prefer text messages, emails, phone calls, or standard mail, VisionPRO lets you stay on top of your defendants from anywhere and everywhere. You set the schedule and the delivery method and VisionPRO does the rest. From defendants to attorneys to indemnitors, keep each and every interested party up to date on everything from court dates and payments. Better notifications means lower FTA’s and increased payment collections. A MOBILE APP WORTHY OF DOWNLOADING. With its proprietary mobile check-in app, Check My Bail, VisionPRO allows you to keep track of your defendants 24/7 without lifting a finger. As always, you set the schedule and frequency and VisionPRO does all the work. Your defendants just click on a text link, snap a selfie, finger sign a confirmation and they are all checked in. The check-in dashboard allows you to manage all of your check-ins in one place so you can see who has checked-in and who hasn’t. KNOW WHERE YOUR DEFENDANTS ARE AND WHERE THEY HAVE BEEN. VisionPRO doesn’t just track the current location of your defendants, but more importantly, it tracks where they have been. With its innovative heat mapping technology, VisionPRO gives you a complete 360 degree view of your defendant’s geographical behavior based on their check-ins. 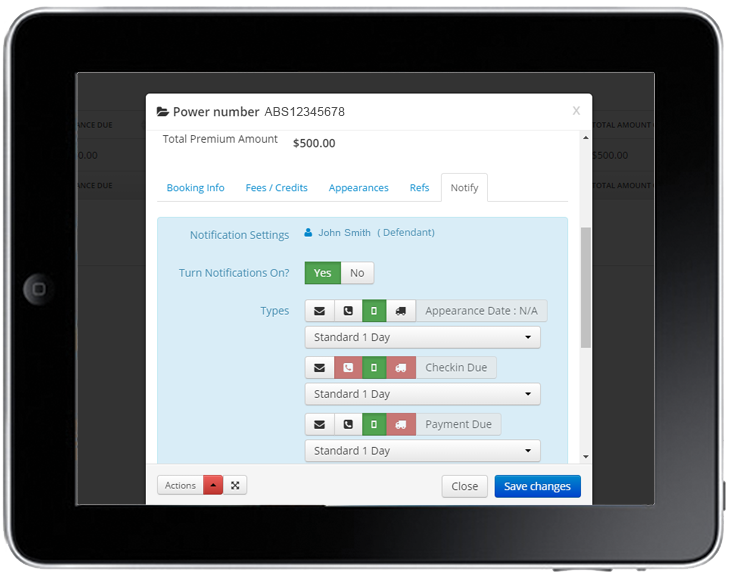 CREATE, SCHEDULE AND MANAGE PAYMENTS LIKE NEVER BEFORE. Want to create a payment plan based on time? How about a payment plan based on a specific amount? 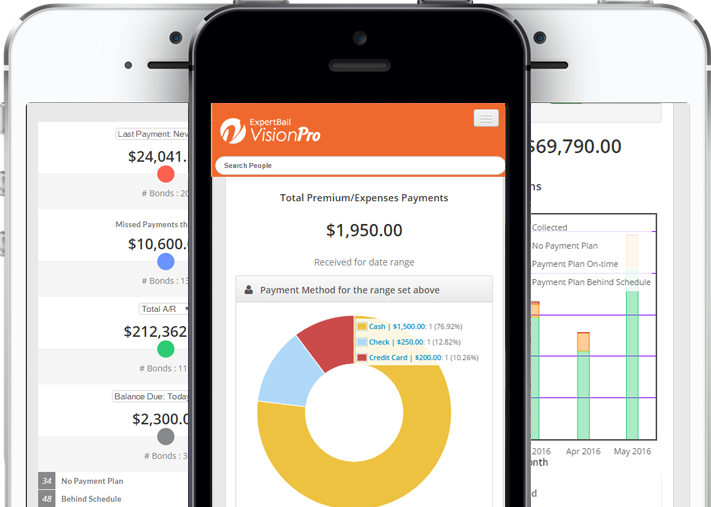 VisionPRO gives you the control and flexibility to create and customize the most appropriate payment plan for each and every one of your customers. 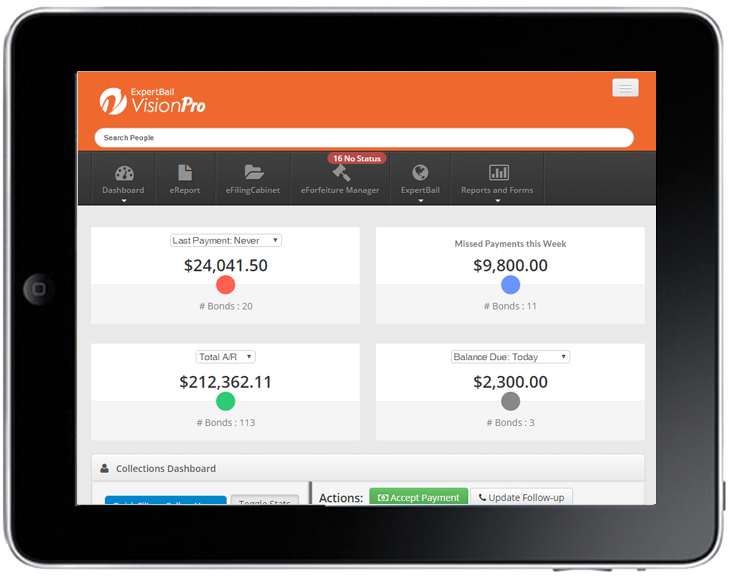 Additionally, with VisionPRO’s comprehensive collections dashboard, you will have insights into how much your agency has collected, as well as how much is currently owed. This combined with VisionPRO’s advanced notification technology will help you and your team increase your collections processes and their effectiveness overnight. INCREASE THE EFFECTIVENESS OF YOUR MARKETING WITH INSIGHTS AND ANALYTICS. How much does each customer cost you to acquire? Should I still be investing in Yellow Pages? Should I invest in a website? How much should I spend in pay per click advertising? VisionPRO’s marketing analytics give you the insights you need to not only answer these questions, but more importantly, make the best marketing decisions possible. Rest your writing hand and start letting technology do what it was designed to do… make your job easier. VisionPRO is designed to take the information you have entered in the system and automatically populate and complete all of your bail forms with the simplicity of pushing a single button. No more filling out forms in duplicate by hand or worrying about whether you have the correct forms for out of state transactions. WANT TO KNOW MORE ABOUT A DEFENDANT? NO PROBLEM. 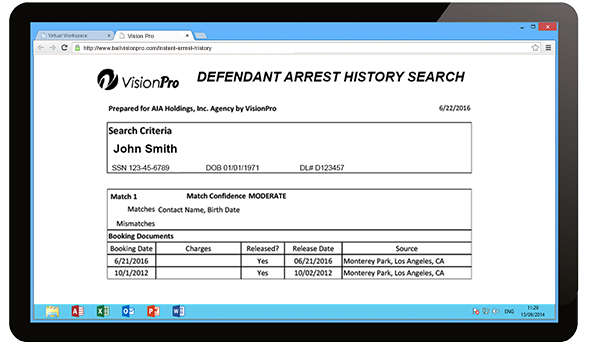 Run one of VisionPRO’s instant arrest report and discover up to 7 years of arrest history on any of your clients. In partnership with Appriss, the nation’s leading provider of victim notification data, VisionPRO has access to this vital arrest data all over the country. 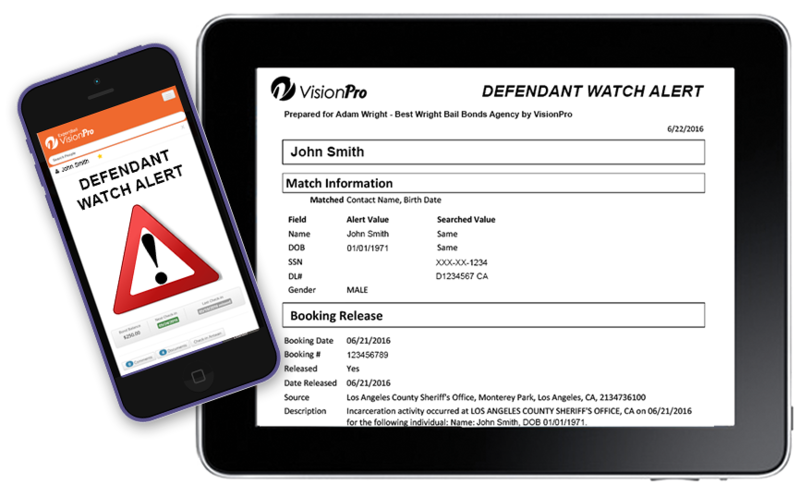 Just enter the defendant’s information and VisionPRO will do everything else. GET NOTIFIED INSTANTLY SHOULD YOUR CLIENT BE RE-ARRESTED. Have you ever paid out a judgement on a bond and found out later that your defendant had actually been in custody in another county or even state? With VisionPRO, you no longer have to be left in the dark. Once again, through our partnership with Aprriss, VisionPRO is able to provide nationwide defendant watch services. With a single click you can turn on a “watch” and be instantly notified if your defendant is re-arrested anywhere across the country. This information can help you better manage your defendants and better manage your risk. FINALLY A WAY TO MANAGE YOUR POWERS MORE POWERFULLY. 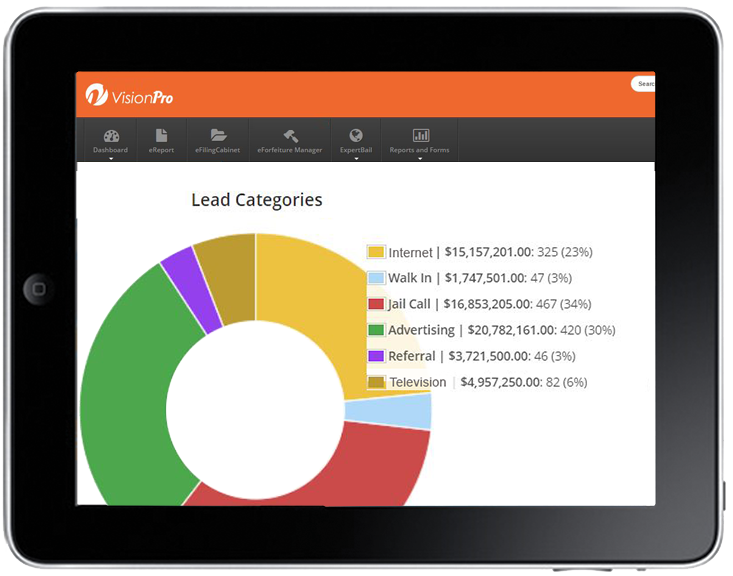 With a simple single dashboard, VisionPRO helps you seamlessly manage, track and distribute your power inventory across your agency. KNOWLEDGE IS POWER AND WITH VISIONPRO, YOU GET BOTH. VisionPRO allows you to dive into your agency’s information in ways you could never imagine. From collections efficiency reports, lead generation analysis and behavioral heat mapping assessments, you have access to vital agency data that can not only help you make better decisions, but make your agency a better business. ISN'T IT TIME YOUR AGENCY HAD VISION? Contact our team at 800.935.2245 or fill out the form below to have our team contact you.